This entry was posted on September 24, 2015 at 08:50 and is filed under Climate Science Survey, Consensus, English. You can follow any responses to this entry through the RSS 2.0 feed. You can skip to the end and leave a response. Pinging is currently not allowed. Or take Verheggen’s study. In the sample selection phase, they decided that these are the people they want to ask. After having seen the answers, they decided that some of their interviewees are not worth listening to. As I also pointed out at Collin’s place, in his supposed submitted comment he included for Oreskes the “no position” (consensus = 75%), for Cook et al he removed the “no position” (consensus = 97%). Had he treated Oreskes like he did Cook et al, it would be 100 vs 97%. Suddenly he has two supposed ‘outliers’. So it is quite rich that he accuses Bart of data manipulation to get the answers he wanted. Bart, I can’t any longer say I’m surprised by this kind of writing from you, but I am saddened. You are incorrect in your description of your own survey. You are incorrect in your description of others as well. Anderegg, Prall et al. is junk. Spencer Weart was correct when he rubbished the paper the day it came out. They miscounted papers, got scientists’ specialties wrong–they miscounted the number of papers published by one of the paper’s co-authors. They searched only in English and used Google Scholar. Worse, they cherry-picked victims of their attack from the documents used as referrers. They got 46 names from a paper called the Science and Environmental Policy Project. There are 4,000 signatories to the 1992 statement from the Science and Environmental Policy Project. Why did Anderegg, Prall et al limit themselves to just 46 names from this list? Is it perhaps because they didn’t want to include any of the 73 Nobel Prize winners in their list of ‘deniers?’ James Prall runs a weblog that has pictures of those he has labeled climate deniers. For some reason I can’t find pictures of many of those who signed the 1992 statement, including Jonas Salk, Rita Levi-Montalcino, Elie Wiesel, Norman Borlaug, Linus Pauling, etc. RomanM demolished their use of poor math in their analysis in a post over at Only In It For The Gold which I can’t find. I focused on the breach of ethics in social research caused by using the meta tag ‘denier’ on their paper and linking from their paper to a website that published the names and even pictures of the respondents. And, as with all the Konsensus literature searches, a mystifying inability to come up with numerous skeptic papers published during the period researched. Hundreds of them actually. Literally hundreds of factual errors. I see Tom Fuller demands Tol does not include Anderegg et al. Oh wait, he complains Bart points out Tol misrepresented Anderegg et al. No surprise there. Of course, Tom Fuller himself misrepresents the statement that many Nobel prize winners signed (The so-called Heidelberg Appeal). The latter does not in any way challenge climate science. It is perhaps therefore no surprise that more than half of the Nobel prize winners who signed the Heidelberg Appeal, also were signatories to the UCS’ “Warning to humanity”, which was a lot more explicit on ecological challenges. Marco, Prall et al culled 46 of the people they labeled deniers from signatories to this letter.Why? Why only 46? Why not label Norman Borlaug a denier? > You are incorrect in your description of others as well. Which description? BartV simply shows that RichardT’s argument is invalid. There’s no need to describe others’ research to do that. We now return to GW’s “but Anderegg” squirrel program. Tom, first of all they are called UE, as in “unconvinced experts”. Which actually takes away some of the worst of the worst in several of the sources Anderegg et al used. Not also that all of them *put themselves on a list*. If they don’t want to be on a list that indicates they are ‘skeptical’ of the IPCC conclusions, DON’T SIGN UP FOR A LIST! This post is about how Tol (mis)represented several consensus studies; the sort of criticisms of one of those studies that Tom brought up and that others responded to is not relevant to Tol’s portrayal of those consensus studies and thus not relevant to this post. Please abide by the comment policy: remain on topic and refrain from accusations and derogatory language. Tom, I checked, and Anderegg et al state they used the SEPP 1992 statement, NOT the Heidelberg Appeal. There were 47 signatories to the SEPP statement, and all of them were included in the analysis. (the direct link no longer seems to work). Conclusion: you falsely accused Anderegg et al. Marco, where did you check? Marvel Comics? Oh–Sourcewatch. Project (46 names), 1995 Leipzig Declaration (80 names), 2002 letter to Canadian Prime Minister Jean Chretien (30 names), 2003 letter to Canadian Prime Minister Paul Martin (46 names), 2006 letter to Canadian Prime Minister Stephen Harper (61 names), 2007 letter to U.N. Secretary General Ban Ki-Moon (100 names), 2007 TV film The Great Global Warming Swindle interviewees (17 names), NIPCC: 2008 Heartland Institute document “Nature, Not Human Activity, Rules the Climate,” ed. S. Fred Singer (24 listed contributors), 2008 Manhattan Declaration from a conference in New York City (206 names listed as qualified experts), 2009 newspaper ad by the Cato Institute challenging President Obama’s stance on climate change (115 signers), 2009 Heartland Institute document “Climate Change Reconsidered: 2009 Report of the Nongovernmental Panel on Climate Change (NIPCC)” (36 authors), and 2009 letter to the American Physical Society (61 names). 1. There are 4,000 signatories to the 1992 statement from the Science and Environmental Policy Project. Why did Anderegg, Prall et al limit themselves to just 46 names from this list? Is it perhaps because they didn’t want to include any of the 73 Nobel Prize winners in their list of ‘deniers?’ James Prall runs a weblog that has pictures of those he has labeled climate deniers. For some reason I can’t find pictures of many of those who signed the 1992 statement, including Jonas Salk, Rita Levi-Montalcino, Elie Wiesel, Norman Borlaug, Linus Pauling, etc. But what were 73 Nobel Prize winners doing signing a ‘denialist’ letter? Were they fooled, scammed, drugged into submission? Bart, what if Tol is right? I’m not saying he is–I haven’t read his comment. But I will say that the famous literature reviews–Oreskes ‘Beyond the Ivory Tower’, Anderegg, Prall et al PNAS 2010 and Cook et al, ‘Quantifying the Consensus’ ERL 2013 are so seriously flawed that you should not want your paper associated with them. Your survey is good. I have gone over my objections to your reporting on your survey elsewhere. AFAICT Tol’s objections regarding your team’s work are focused on the same area I object to–ignoring the headline figure and focusing solely on subgroups. But it would not be a good thing for a valid survey to be lumped together with egregious examples of junk science. The website Skeptical Science provides links to 117 papers by skeptical scientists published during the time frame used by Oreskes in Beyond the Ivory Tower that she did not report finding in her paper. Quantifying the Consensus used amateur reviewers who violated the terms of their agreement with the research team regarding communicating with each other and not searching for the authors of abstracts they were reviewing. One reviewer classified 765 abstracts in 72 hours. Scientists subsequently contacted have repudiated the classification of their paper. 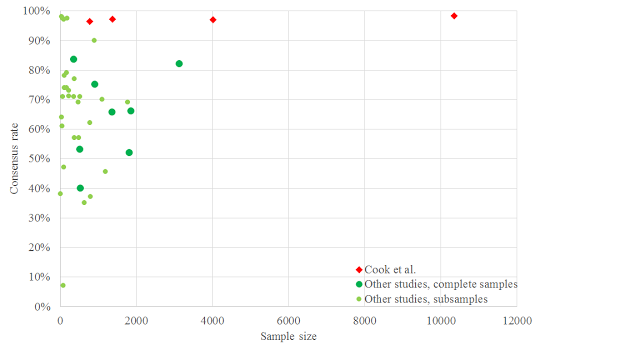 Your research study is of much higher quality than Prall et al, Oreskes and Cook et al. They are junk science. Your work is not. Marco, did you contact the paper’s authors? I ask because I may be in error. SEPP has promoted the The Heidelberg Appeal which was publicly released at the United Nations Earth Summit held in Rio de Janeiro from June 3-14 1992. 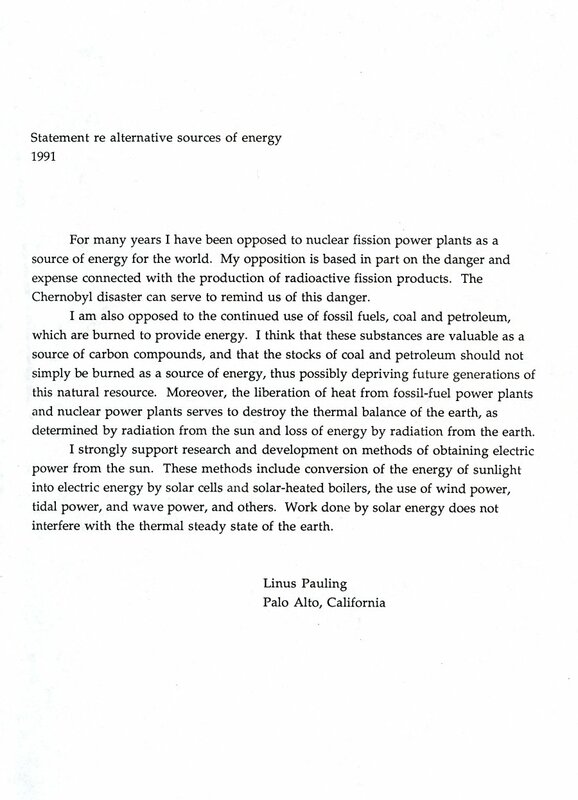 Published a “Statement by Atmospheric Scientists on Greenhouse Warming” which objected to the United Nations Conference on Environment and Development Earth Summit planned to take place in Rio de Janiero on June, 1992. The paper I link to and have referenced is the June paper. If you have confirmation from Prall or any of the others involved in Anderegg, Prall et al PNAS 2010 that they in fact used the February paper, then please let me know so I can correct the errors on my weblog. I will do so somewhat grumpily as the citation from their paper reads as follows: “1992 statement from the Science and Environmental Policy Project (46 names)”. It will not affect the rest of my criticisms about the paper. They got basic data wrong, they search using Google Scholar and did not cross reference with easily available databases of academic publications. They got the math wrong in their analysis. Most egregiously, they labeled participants in the survey ‘deniers’ and included a link to Prall’s website where the participants could be identified. But if one of the authors can say that they referenced the other SEPP letter I will correct my misstatement. If I do correct my statement, I will include the observation that all the signatories to the second letter would fit Bart’s definition of ‘expert’ climate scientists due to the number of publications each of them has achieved. Tol’s reanalysis of several survey’s numbers goes a lot further than just agreeing with you on those particular points (including vs excluding responses without an actual estimate; including vs excluding the other relevant attribution question; focusing on subgroups or not). Read my post again. Many of the numbers he puts in his graph are entirely meaningless as an estimate of the scientific consensus on climate change. That conclusion is independent of what you think of those other consensus studies. E.g. you can’t meaningfully judge scientific consensus by looking at a subsample which was constructed on the basis of their stated opinion on the issue at hand. That is a circular argument. They list this document: SEPP92: 1992 SEPP Statement by Atmospheric Scientists on Greenhouse Warming, 47 signers (all listed): SEPP 1992 statement on greenhouse warming. Bart, when you invited climate scientists to participate in your research study, did you already know you were going to segment them by number of publications? If so, did you notify those with fewer publications that they would be considered ‘inexpert’? No, we didn’t. By the way, the adjective “inexpert” is yours, not ours. We did ask the questions we asked in order to be able to relate answers to each other in a general sense, but no, we didn’t set out in advance to segregate responses regarding a consensus position specifically by number of publications. Well, if people with more publications are more expert, which you have said, what does that make people with fewer publications? If you decided to focus on number of publications as a report criteria after looking at the results it was even more incumbent upon you to clearly walk through them, starting with the headline number. Tom, I already pointed out the dead link, that’s why I used Sourcewatch as a link, as it lists the signatories. It is clear that they used the February 1992 statement from SEPP, simply because the Heidelberg Appeal is NOT a SEPP letter/statement. Even the one link you managed to find makes it clear that SEPP only *promoted* the Heidelberg Appeal and that Fred Singer may have been involved in drafting it. That still does not make a SEPP letter/statement. Jim Prall’s homepage that is linked in the SI makes it even more clear. You may also want to read the Heidelberg Appeal and see how that fits with any supposed skepticism about climate change. There is no mention of climate change. It really is that simple to show that it isn’t the SEPP statement that Anderegg et al used. I have no need for further confirmation, and you should not either. If you do, you’d be lying. For Bart to include them as experts they would have to have publications related to climate change. Many don’t. I am not even sure all of them have any publications at all (does Roy Leep? Elliot Abrams? Brian Sussman? Robert E. Zabrecky? I could not find any). Marco, those guys were so inept that nothing is clear about what they have done. I’m inclined to agree with you but I’m going to wait and see. I’d hate to have to retract a correction. It is obvious what statement they used to anyone but Tom Fuller (who were inept again?). You can even go through Prall’s database with names and find those signatories of the SEPP92 statement. Groundskeeper Willie rips off his shirt and chases squirrels in yet another thread. While persistence may be a ClimateBall virtue, this fails to address BartV’s argument. Not the best lukewarm practice. Where’s the justification for Tol’s lowballing? I once made a study that found 97% agreement that dogs are black. Would that apply to a subsample of scientists selected because of number of publications? Odd question; of course that does not apply. They are not selected based on their opinion, but based on their expertise. No Marco, as Bart says, publication number is not equivalent to expertise. It is used as a proxy for it, but IMO probably should not be, for reasons discussed on the last thread. Bart has previously acknowledge the serious flaws in using publications as an equivalent for expertise. As none of you can find another metric, you use it. You probably shouldn’t. 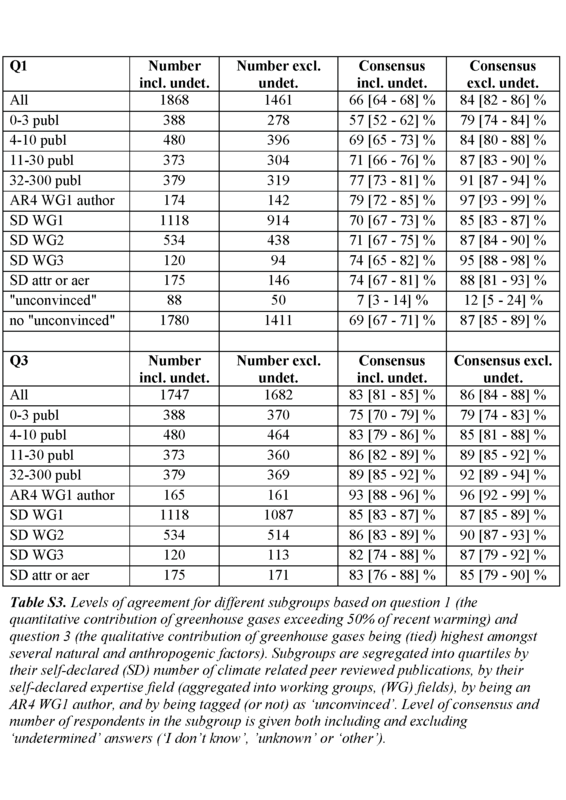 However, publication frequency can also be viewed as a proxy for alignment with the editorial opinion of journals, which in this case means the standard consensus view on anthropogenic contributions to climate change. Tom, it can be viewed as such, but you would do so without any evidence whatsoever to back it up. Just show me that the “editorial opinion” of the top-10 journals in climate science is “AGW > 50%”. Authors cannot know the editorial opinion, most journals do not publish any statements about there being a consensus. Moreover, most of those with a lot of publications have been publishing for more than 20 years. You’d have to show that this was the “editorial opinion” already more than 20 years ago. And after you have shown me what you believe to be evidence that this is the consensus “editorial opinion” already so long ago, you need to explain the publication records of e.g. Lindzen and Pielke Sr. Based on your argumentation, they should not have been able to get such a long publication list. It is starting to look a lot like you simply do not like the answer and therefore “MBW”. Regarding using the number of publications as a proxy of expertise, I said e.g. Your caveats re number of publications are mostly valid. But even if imperfect, it can still be a useful indicator of a respondent’s expertise, esp because we cast such a wide net of respondents. You seem to argue that it could likewise, or even more so, be regarded as a proxy for somebody’s opinion. That to me is a strange and unsupported claim. Number of publications relates logically to how much scientific research somebody has been engaged in. There surely are many more variables influencing someone’s number of publications, that’s why I said it could be used as an imperfect proxy. Ideally, a publication is accepted or denied based on scientific validity; not based on the opinion of the authors. I know peer review isn’t perfect (I could give some examples based on my own experience), but there isn’t a conspiracy either where people with certain opinions, even though their work is perfectly legitimate scientifically, are prevented from publishing. I’d wager that every scientist has had the experience of their work not being accepted for publication for reasons that they disagree with. That doesn’t mean that they’re being censored. 1. Very capable younger scientists have not had time to establish a record of publications. Dismissing their opinions leads to loss of useful information. 2. As ‘alarmists’ like to point out whenever an older scientist expresses a skeptical viewpoint, at some point in the natural cycle of a person’s career, ongoing education becomes less important. One can make the case that someone reaching the end of their career actually knows less than a freshly minted scientist. 3. The tools and techniques used in tertiary education are different than they were when many older scientists were educated. In addition, new knowledge is incorporated into texts available to younger scientists. This again may advantage the young at the expense of the old. 4. Some scientists are co-authors of numerous papers for reasons other than their ability to contribute to the main body of the scientific arguments advanced in the paper. Their publication count may be more impressive than their actual command of the field. 5. Some very good scientists work outside the academic world and publication may not be a priority for them. Using publications as a proxy for expertise again may devalue their opinions. I see no good reason to accept your statement that “Number of publications relates logically to how much scientific research somebody has been engaged in.” Are there publications supporting this point of view? It seems in the way you refer to it that it is an assumption on your part. I think the 5 points I list constitute an argument that the assumption, if that is what it is, is unwarranted. Because your analysis framework emerged after viewing the results of the survey, as you mention above, it seems that you are in the position of trying to compensate for unwanted results. And I know you better than that, Bart. I don’t think you operate that way. But you haven’t adequately (for me, at any rate) explained your analytical choices. In fact, a cursory overview of publications regarding publication counts shows that the problems pub counts face in providing valid information are formidable. Myself being in a high school physics class find it interesting that other scientist manipulate good evidence for personal reasons or because “They wanna stand out”. You would think that everyone would want to be one the same page when it comes to climate change due to it be one of the most rebuttled scientific facts, this is why people are skeptical when looking at new data because of the people who manipulate.